Aside from Thanksgiving, Americans eat more on Super Bowl Sunday than any other day. UFCW members in grocery stores and in food processing plants across the country have been working hard to prep the meats, cheese trays, deli sandwiches, veggie platters and other great game day snacks we all love. The most popular food for Super Bowl Sunday? Chicken Wings. While the amount of wings projected to be eaten this weekend is enough to circle the earth three times, there are some shifts in customers’ preferences. According to Nielsen, more and more customers are turning to fresher wings, opting either to pick them up fully cooked at the deli or buy them uncooked and make them themselves. 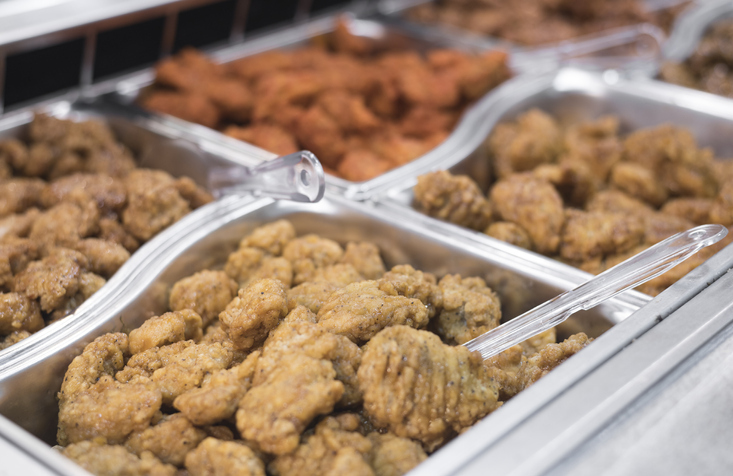 Fresh meat wings sales have gone up 31 percent in the past year, and deli cooked wings saw an increase of 15 percent. Many of those wings will have either been processed by UFCW members at unionized poultry processing facilities or cooked and served by UFCW members at unionized grocery stores. Thanks for all your hard work, guys!